When the term Transgressive (capital “T”) is used for art, most are going to think of it in relation to cinema, with films created by the likes of Richard Kern, Scott and Beth B., and Lydia Lunch. When it comes to other forms, such as music, at best it tends to be considered transgressive (small “t”). This is not fair, especially for a period of the mid-to-late 1970s and early 1980s, when there were combative bands like Red Transistor (led by Von LMO, who would chase patrons out of bars with a chainsaw) and especially Suicide. It makes sense to combine art forms of film and music, perhaps to make something new: TRANSGRESSIVE (all caps). I had the… pleasure to see Suicide play once at CBGBs in the early 1980s. Knowing their reputation for confrontation with the audience, I sat near the bar, but that didn’t help. As singer/provocateur Alan Vega (d. 2016) roamed the club while keyboardist Martin Rev stuck to the stage sending out punkabilly pulse waves. I’d been a fan of the band since their first eponymous album in 1977 on Red Star Records. “Cheree” caught my attention first, but one listen to the 10-miniute plus “Frankie Teardrop” was what reeled me in. 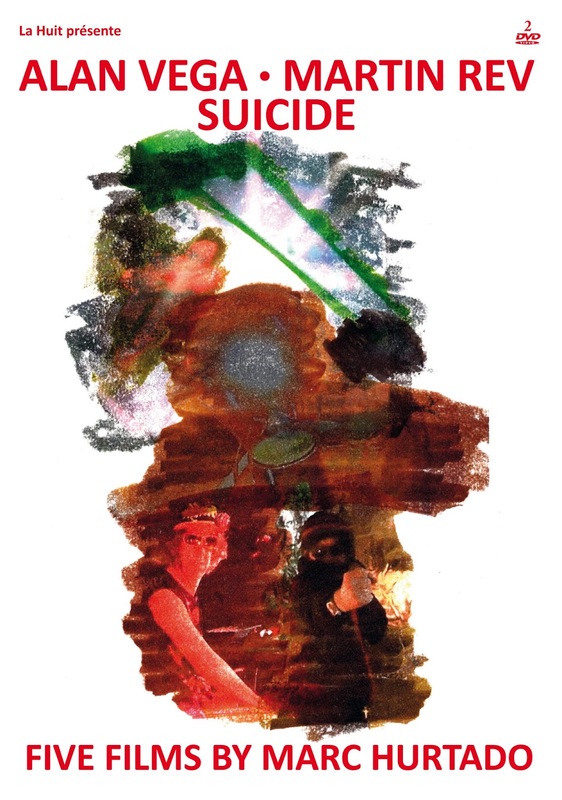 Suicide should have been everything I hated back in 1977: it was pure electronica, and to this day I mostly find that to be, well, musical suicide. But there was an artistic intensity that Vega and Rev brought to the minimalism that was different than, say, Teenage Jesus and the Jerks’ factory-like clunky and metallic rhythms. They were not just musical terrorists, they also were seducing the audience at the same time, like a snake charmer coaxing a cobra, except if the reptile was the safer choice. Morocco-born director Marc Hurtado filmed a bunch of mostly shorts with Suicide before Vega’s death, and these are collected onto this dual DVD set. Both discs contain the same films, but one is in the original French, and the other in English. I’ll let you guess which one I chose. First up is the 16 minute-long The Infinite Mercy Film (2009). Here is a mixture of an artist’s muse and its outcome. The locus is on Vega’s use of light and lighting as a paradigm in his paintings, as the camera focuses in and out of various mixed-media, while Rev’s rhythms wind their way around the image in a reflexive way to match Vegas’s use of cords, twine and light bulbs. Interspersed is Vega himself, as he describes the origin of his use of light and what feeds his influences. The level of avant-garde artistry used to mix the music, the artist, the filmmaker and the synergy they create together should come as no surprise. 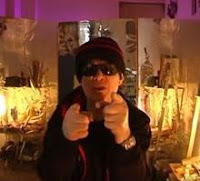 At 6 minutes, we are given Saturn Drive Duplex (2011), which is essentially a music video for a collaboration of Vega’s speak-sing voice and Hurtado’s music. Where the first film was focused on light, this one is on motion. We follow the clips as they zoom along traffic in Manhattan (often on the side of the East River), close-ups of boxers sparring, and Vega posing oddly in his studio. Hurtado also uses shadows and, yes, light, to highlight his focus both in high contrast and subtle ways. Saturn Drive Duplex Redux (2014) is 4 minutes and artfully combines and condenses the three previous films, using light, travel, and art into a different Vega/Hurtado music video for a remix. We also get to see b-roll images of Vega on stage added to the recipe. Perhaps it’s the shorter length, but this feels like the most rewatchable of all I’ve seen so far, and this material is the kind you really need multiple viewings to let the whole Zen of it wash over the experience. One could refer to Infinite Dreamers (2016) as the main feature, due to its 82 minutes’ length. Essentially, this is Martin Rev’s film: a stream of consciousness from the mostly silent member of the duo with a mixture of clips of Suicide playing in various venues, such as Frioul Islands, France, and of course lots of B-rolls. This makes total sense, as they are considered cult heroes in that part of the world, and Vega even had a solo hit in the area with “Jukebox Babe” in the day. It’s quite obvious that the sound is camera-oriented, rather than through the mixing board, so it is kind of rough, with lots of echo and reverb, even beyond the band’s normal tone. It’s also way less confrontational, with Vega looking very frail as it was close to his end; he stays on stage rather than rampaging through the crowd. But like I said, this is Rev’s turn to step into the spotlight. Despite his talking, I would never use the word “narrative” to describe the whole thing, but it is as close to a storyline as we have seen so far. 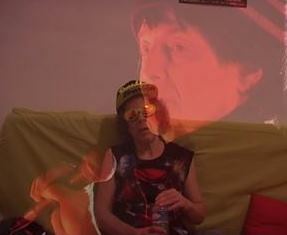 It is, rather, various clips of Rev speaking – both on camera and off – and discussing the history of the group, and Suicide’s role in the artistic world; especially their philosophy as far as art is concerned. It’s deep and meaningful, and while these monologs doesn’t seem to follow a particular path, it still all falls together into a transgressive (small “t”) pattern that can be put together as a whole in the end in the mind for the viewer. The fifth film is Saturn Drive (2016), at 5 minutes, which was released posthumously after Vega’s passing. Essentially, it’s a one-camera shot of Vega in the Hospital after a bad fall where he did serious harm to his hip. He looks drugged out of his mind on pain meds. He talks about being in “Saturn Drive” (heaven? hospital? stoned? ), his religious affiliation, and seeing 9/11. I’m willing to assume this is the last footage of Vega before he went over the rainbow bridge, and it’s touching. So, overall, Hurtado seems to model himself a bit on filmmaker Stan Brakhage, who used the media form as his easel to let the film itself tell the story (a true “Medium is the Message” kind of mindset that would have made Marshall McLuhan proud). For Hurtado, the visual scape is as important as to what he is trying to convey to the audience, that art is multi-layered, and should be addressed as so. While I have always preferred the narrative framework over the stream of consciousness kind of art in various modes, I enjoyed the films and getting to see some of Vega and Rev at work is always enlightening.